Here’s another pair of California summer whites, this time from Geyser Peak. The winery dates back to some of the original Sonoma growers in the 1880’s. The name refers to a mountain overlooking the Geyserville vineyards where the morning clouds would crash against the summit and plume towards the sky. Geyser Peak 2012 California Pinot Grigio – This wine is instructive on the American laws on wine naming. For a wine to be labeled as a particular varietal – meaning it says “chardonnay” or “zinfandel” – the wine must be comprised of at least 75% of a particular grape. The remaining 25% can be used at a winemaker’s discretion. Thus, a “Pinot Grigio” might have up to a quarter of its total volume made up of other grapes. Lest you think that’s some sort of cheating, adding a touch of a secondary grape variety or two can markedly improve a wine’s complexity and flavor. In some areas of France and Italy, one can be hard-pressed to find a wine that isn’t a blend. In this case, Geyser Peak blends some gewürztraminer into their Pinot Grigio to produce a more aromatic character. I thought it brought out some interesting scents in the bouquet, which to me smelled of sliced apples and apple blossoms. The body has initial flavors of apple and melon alongside a mineral character which I expect comes from the gewürztraminer. The finish quickly went from melon to a lingering flavor of tart grapefruit. I picked up a bitterness at the end which the Sweet Partner in Crime did not. She liked this wine quite a bit, while I was somewhat lukewarm on it. $14. Geyser Peak 2012 Sauvignon Blanc – No need for varietal-based discussion here. This white is 100% sauvignon blanc. The nose is heavy with flowers and tropical fruit. I thought it was fairly light bodied for a California sauvignon blanc, which can sometimes trend towards the sticky. There’s also a minerality here reminiscent of some white Bordeaux that is usually lacking in many domestic sauvignon blancs. The ripe, tropical flavors on the nose are in full effect on the body along with some melon, which fades gradually into a lingering fruity finish. I appreciated that this wine had a very good balance. We ended up pleasantly polishing the bottle off on its own, but I’d think this would be good with Thai food or a salad that had a dressing with a little zing. It retails for $10-12. I'm a sucker for a good story. Especially if the story involves good neighbors and wine. It's July 2012 in Provence, France. A freak, vicious hailstorm blows up over the vineyards of Chateau de Roquefort, a winery dating from the 1700's which produces "Corail" -- a longtime favorite here in the world of the Naked Vine. 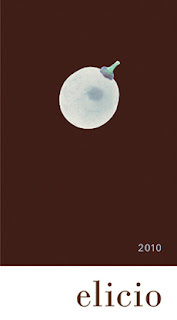 In seven minutes, their entire 2012 crop is more or less destroyed. 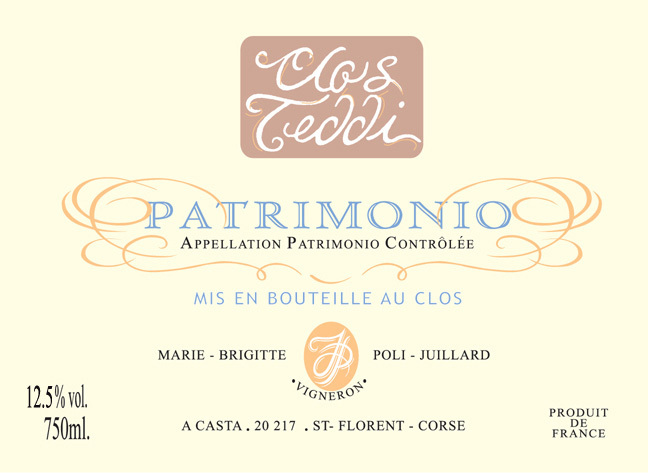 There would be no 2012 vintage of this wine, or many of their other selections. Enter a collection of 37 vignerons from around the province and beyond, each of which contributed some of their own harvest to the winemakers at Roquefort so that they would not have to miss a vintage. The folks at Roquefort got to work on a rosé thanks to the generosity of their friends. 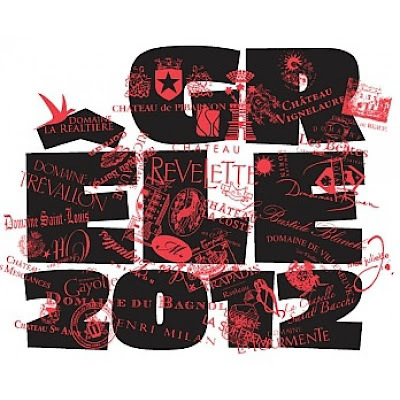 The result was Chateau de Roquefort's "La Grêle" 2012 Rosé -- a true regional partnership borne from compassion and friendship. The story in and of itself warranted a tasting in my eyes. One of the truly interesting notes about this wine is that it's a first of its kind in France. As we've discussed previously, French wine law is extensive and very specific -- especially when it comes to the naming of wines. 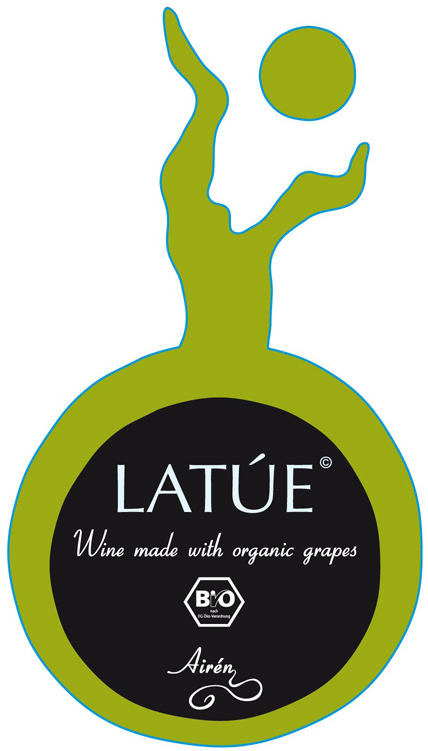 Under normal circumstances, a wine can only be produced from grapes grown within a particular area. With La Grêle (French for "the hail"), however, the grapes came from multiple growing regions. Thus, rather than a "Cotes du Provence" as you'd usually see, this is an "IGP Méditerranée" -- which translates roughly as "frickin' mishmash that we don't have a real name for." How is it? Pretty darned tasty. 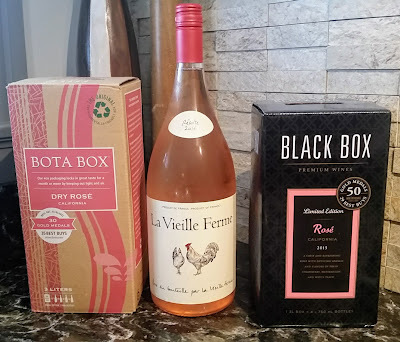 If you like Provence rosé (and if you don't, dear god why not, you silly person! ), then you'll find this to be right in line with many of those. Substantial in flavor without being overly heavy, full of peaches and raspberries, and very clean. I thought it held its own against just about any pink wine I've tasted this year. Well worth the $16 pricetag, and easily spotted on your local wine store's shelf because of the distinctive label, adorned with the names of the "With a Little Help From My Friends" crew of winemakers. Last year, I did a story on 20 Mondi, a project by graphic designer and journalist Michael Loos in which he visited all twenty Italian wine growing regions, focusing on autochthonal grapes. “Autochthonal” is the term for grapes indigenous to a particular region. There are over 600 indigenous grape varietals in Italy. Many are being grown in increasingly smaller quantities, replaced by more commonly demanded varieties. 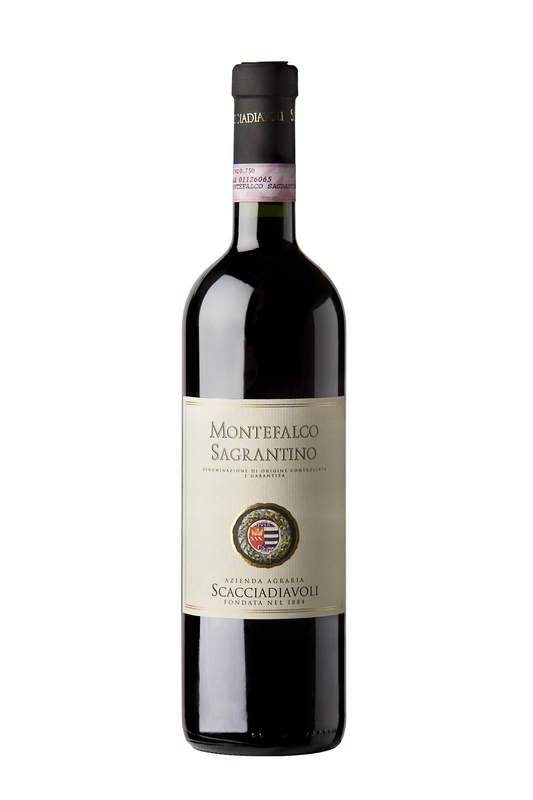 Such was the case with the Sagrantino di Montefalco grape from the province of Umbria. 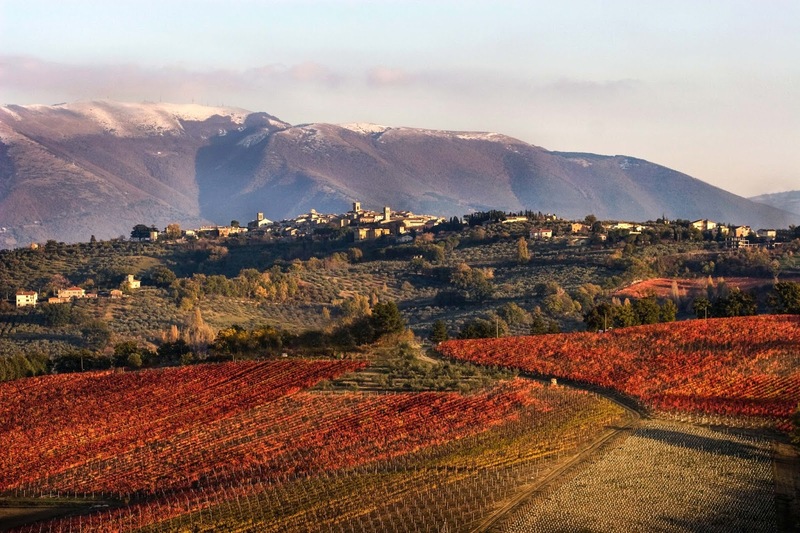 Loos describes Umbria as the “green heart of Italy,” as it is the only land locked province. 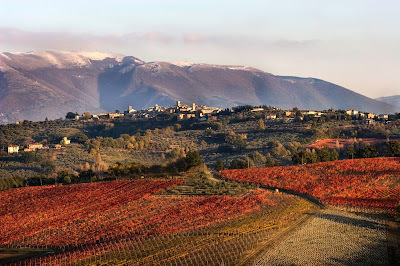 Cultivation of Sagrantino in Umbria can be traced to the town of Montefalco in 1549, although vineyards in that area date back as far as 1088. 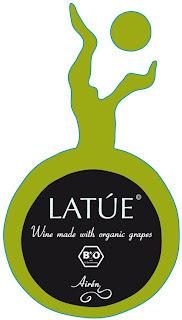 The name of the grape comes from the Latin “sacer,” meaning “sacred” – referring to the concentrated raisin wine produced by monks in this area both for religious rituals. A “regular” version of this wine was consumed in quantity during religious feasts and festivals like Easter and Christmas. Umbria is known traditionally for white wines. A combination of demand for those whites and the relative low yields of Sagrantino vines pushed much of the native red varietal out of the local vineyards during the 1960’s and 70’s, almost wiping it out completely. In 1979, a few wine producers sought a “classified status” for Sagrantino, which allowed broader cultivation. The status was granted in 1992. From that time, the acreage of Sagrantino vineyards has quadrupled. Speaking of tasting, these are frickin’ enormous wines. I considered Barolo and Barbaresco to be the “big Italians” until I tried Amarone – the super-concentrated wine made from partially dried grapes in Valpolicella. Move over, bambini. Sagrantino are inky black in color, highly tannic, and very high in alcohol. One of the samples clocked in at 15.5%. So if you’re trying them – decant, decant, decant! (And assign a designated driver if you’re not at home.) Get the wine into a decanter a minimum of 90 minutes before you start your meal. Honestly, I’d open it at lunch to serve it with dinner. Aromatically sensational. Intense, with notes of mature fruit and hints of spice and aromas of vanilla transcended from the barriques. On the palate the wine is potent, soft and velvety, with a slightly bitter aftertaste. Spicy nose with a scent of cinnamon that doesn’t overpower the aroma of red fruit and black cherry. A very full and persistent wine with an agreeable touch of rustic bitterness. Complex, elegant and intense nose with notes of red fruits, red citrus, ripe plums, herbs and leather. An immense wine balanced by fresh acidity and a spicy finish. The first meal I made for these wines was lamb shoulder braised in a fresh-sage and rosemary tomato sauce over penne, with the Perticaia alongside. The “middle” wine’s considerable strength allowed it to harmonize beautifully with the rich flavors in that lamb dish. The description above for the wine’s flavor above is apt, but alongside the strong herbs and savory richness of the sauce & ultra-tender meat – the fruit flavors hidden beneath that tannic blanket start to emerge and balance. A hedonistically good pairing. With a day off for the 4th of July, I put together one of my famous eggplant parmesans – one of the SPinC’s faves. Eggplant parm needs a tannic accompaniment. The Collepiano (selected by the Wizard of Covington) went into the decanter as I was making my sauce. A couple of hours later, the parmesan was ready, the wine was poured, and…we puckered. I can’t remember ever tasting a wine this tannic. Any fruit there was lost beneath a layer of asphalt. The finish was almost an unearthly level of dry. “I just can’t do it,” said the Sweet Partner in Crime, switching to a glass of Montepulciano d’Abbruzo. I got through a glass of it and switched over to the Montepulciano myself. I put the wine back in the bottle, stoppered it, and gave it a try a few other times over the following weekend, hoping that it would develop some flavor structure. It never did. I figure either this wine was more man than I am, or we might have accidentally received a flawed bottle -- as it did develop a slightly vinegary aftertaste. However, I wasn’t going to let a $50 dollar bottle of wine go down the drain. I’d always wanted to make a traditional Risotto al Barolo, but I don’t have the budget to blow Barolo money on a cooking wine. Sagrantino has a similar flavor profile, so Risotto al Sagrantino it is! Umbria produces almost half of the black truffles in Italy, so I splashed a little truffle oil on the risotto before serving it with our third wine, the Scacciadiavoli. The risotto turned out fifty kinds of awesome, if I do say so myself. The Scacciadiavoli (Italian for "Devil hunters") was considerably better than the Collepiano, in that it actually had some plum and cherry fruit amidst the tannic tar. The heavy tannins cut through the creaminess, helped by the wine already cooked in to the risotto. I thought it was a really good match. The SPinC, possibly still scarred from the Collepiano, had a small glass and returned to her Montepulciano. “It’s too much,” she said of the wine’s tannin. For my fans of big, powerful Italian wines (Uncle Alan, I’m looking at you! ), a Sagrantino di Montefalco is going to be a nice change of pace. With rich, meaty dishes – especially when there’s a chill in the air – it’s a good choice for a special occasion. I’d definitely do it again with that lamb dish I made. However, if you like your wines on the less intense side, you’ll find lighter reds that will fit the bill better. Summertime sippers. Got to have them. A pair of samples from Pepi Wines showed up not long ago. Astute readers of the Vine may remember that I wrote a review on Pepi’s 2011 vintage last year. I’m certainly not one to shy away from repeat performances. You know…for...um…quality control purposes. Pepi wines generally retail for right around $10. I had a bottle each of the pinot grigio and the sauvignon blanc. How'd they fare? Pepi 2012 Pinot Grigio – As with many California pinot grigios, this bottle makes a very pleasant summertime picnic selection. I found the Pepi to have a more pronounced bouquet than many inexpensive pinot grigios. The nose is full of apple blossoms and lemons. On the palate, it was more full-bodied than I expected. It’s almost a little “glyceriney” on the tongue, but I didn’t find that necessarily to be a bad thing. The flavor is crisp and lemony, although the tartness does turn slightly sour towards the lingering finish. It’s easy to sip on its own, but I would prefer it with food. It would be good with almost any light meal, especially if were seeking a wine pairing for a vinaigrette-dressed salad that has a little bit of fruit in it. Pepi recommends a Cajun-flavored shrimp, fish, corn and sausage skillet, which I could certainly see working. Pepi 2012 Sauvignon Blanc – The Sweet Partner in Crime and I were putting together a dinner of steamed mussels with chorizo and white beans. The recipe we were pulling from suggested a “fruity, California sauvignon blanc.” How convenient that we had the second bottle of Pepi for pairing purposes. This is a much more balanced wine than the price point implies. The nose is full of pineapple and green apple. The body is fruity and citrusy, and the acidity never really becomes sharp – even through the lingering, citrusy finish. Alongside the mussels, the wine was a champ. I thought it handled the savory, spicy, and herbal flavors without getting rolled. We agreed this is a nice, flexible “keep around for your summertime needs” bottle. Bottom line – after peeking back at my review from last year, Pepi has done a good job keeping these wines consistent from vintage to vintage. If you’ve tried them in the past and liked them, you won’t find any surprises. If you haven’t tried them, I’d recommend the sauvignon blanc for a tenner.